I have just finished my first series. I usually create singles...or at most 2 versions of one idea. This time I followed my concept drawings to explore one idea. Each piece borrowed ideas from it's predecessor. 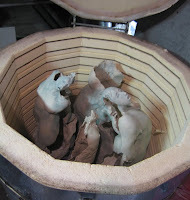 the result is a kiln full of work has the same upward looking form, they make me laugh.